Sleek and professionally styled looking hair can be yours with the IGIA Rollo Style. The IGIA Rollo Style is world-renowned hair stylist Doug Lillico’s instrument of choice to straighten and style hair. Using Rollo Style’s rotating action, your hair will go from dull and lifeless to full and bouncy. 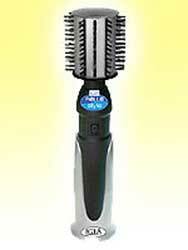 The Rollo Style Brush spins with the right number of revolutions to have tangle free hair. Here’s how it works. As the Rolo Style brush heads spin, they gently straighten and style your hair quickly and easily. The unique nylon bristles combined with the rotating effect bring the hair into the brush, leaving you with the manageable, smoother, and desirable hair you’ve always wanted. Every time you use the IGIA Rollo Style Brush you will be amazed with the results. When used properly, the Rollo Style is guaranteed to work on the toughest and curliest hair without tangles. You’ll have great looking hair at your fingertips with ease! Every time you use the IGIA Rollo Style you will be amazed with the results. When used properly the Rollo Style is guaranteed to work on the toughest and curliest hair without tangles. You’ll have great looking hair at your fingertips with ease!